For very dry, sensitive, extremely dehydrated skin – This VERY rich, non-greasy cream is a great night cream too. New look label. Great for skin all over the body-hands, feet, also is a great hair conditioner– simply work through hair and leave overnight, wash out in the morning with one of our fabulous natural soap shampoo bars. * Choose Marigold (which is unscented) if you are eczema prone. Read about our moisture creams. The secret is to use sparingly on slightly damp skin to seal in moisture. The cream is extremely rich so needs to be worked in thoroughly and left for five minutes or so to absorb into skin. Unlike water based products that leave nothing on the skin, our slow-to-absorb formula means a long lasting protective moisturising barrier effect on the skin. Leatherwood beeswax and honey This hand cream has healing, soothing moisturising, nourishing, penetrating and protective qualities. I really love this moisturizer. Its really beautiful to use. I have oily/combination skin and wasn’t sure if this would work well for me, but I use it as a night cream and its wonderful. I love the gentle smell it has as well. 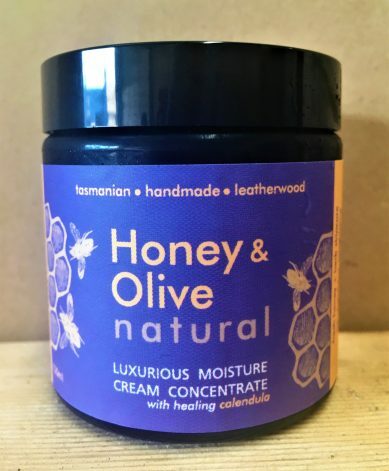 This is a beautiful moisturiser for very dry flaky skin!!…. Only one day after receiving my 15ml sample.. I’m totally sold!! Excellent moisturiser! I have combination skin combined with dermatitis…..this will be my second jar, lasts ages! I also use the soap for my face and neck, really does lock in the moisture! Still feels plump the next night! Thank you for making this brilliant product, life long customer here!! Thank you for your kind words and taking the time to write Maggie, we are glad the product is working for you, we have had a lot of awesome results with this cream. Is this stuff magic!? It’s a wonderful product. You definitely get what you pay for. I noticed results after day one of using this with the Baby Bee Bath Cream and Udderly Luscious Bar. My eczma prone boys are now eczma free and have butter soft, moisturized skin after a week! That’s great Brittany, it’s always good to hear we helped someone. Thank you for taking the time to write.